The Connecticut State Board of Accountancy and the Delaware State Board of Accountancy has authorized CPA Examination Services to release passing score information for the Uniform CPA Examination third parties as requested by candidate. Candidates must complete a separate form for each firm or agency. 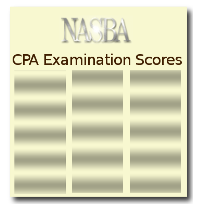 Select the Jurisdiction you want your CPA exam score from.